Some people glamourize regret as if it’s a virtue or an endowment. All some posers need to do to remain relevant on social media is to say they regret voting Buhari. Others less imaginative ask, “Is this the change we voted for”? Whenever I hear these, I am reminded that loyalty is a high-price commodity. President Buhari What are you regretting? If you real voted “change” what did you have in mind? Instead of revealing in your ignorance, should you not be ashamed that you lacked the basic understanding of what you espoused? At your age and with your level of education you still dance to every beat? This is the “change” I campaigned and voted for. From inception, I know real, lasting change comes at a high cost and discomfort. Have you ever attempted to change your life, weight, values or complexion? Did it come cheap or easy? Why do many people fail to life up to their New Year resolution? Genuine change at any level is tough and cruel at first. Nigeria will not be an exception. What happens when corporate organisations decide to change processes and procedures in the workplace? It is usually resisted because most people prefer the status quo. Corporate changes like mergers, acquisitions and reconstructions create imbalance and uncertainties in the concerned entities. I know a man whose workforce reduced by 75%when he restricted (or effected change in) his company. Today the same man is shouting his voice hoarse that Buhari’s change is draconian and insensitive. Hypocrite! Nigerians scramble for Ghanaian “Garri” at Lagos Trade Fair How do we become self-sufficient in food production? The answer is simple: make heavy investment in agriculture and ban importation of foods that deplete our foreign reserve. Take rice for instance. As long as there are no restrictions on the importation of rice, local farmers will not grow rice and our exotic taste buds will not be restricted. If I were Buhari, I would put a total ban on the importation of rice. Take cars, fabrics and wines (and spirits) for another instance. Something drastic needed to be done about our appetite for cars, clothes and wines. 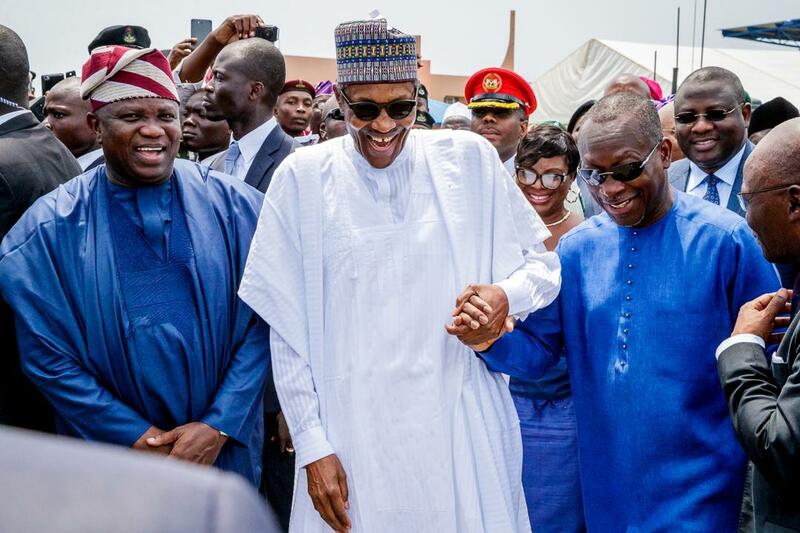 The cumulative costs of importing this trio into Nigeria consumed a substantial share of our foreign reserve. Buhari says NO. He argues that if you must use these imports, then be ready to pay a premium price for them. This is simple logic and economics. This is especially so since global price has dwindle and tempers are high in Niger Delta. Goods are more expensive in Nigeria today because Buhari insists that most of the products we import can and should by produced locally. By so doing, he has flung open unending investment and job opportunities for Nigerians especially. While reserving limited foreign exchange for some critical sectors of the economy, Buhari is urging them to make hay while the sun shines. Buhari is CHANGING the way we live, and the pain we now experience are his instruments of CHANGE. You can only take it, but you can’t reject it. Why is Buhari putting these strategic restrictions on our consumption pattern? If you are a PDP or a hater, these restrictions are to punish Nigerians. But to the dispassionate observer, Buhari’s stance is the most effective route to Nigeria’s escape from economic doldrums festered by inordinate importation of all and every product. Some countries in Asia, Africa and North America have provided infallible precedents to what Buhari has set out to do. What has happened so far? Buhari is in a mad hurry to fix the refineries. About six states are now producing rice in commercial quantities. Cross River sate has almost completed what is arguably the largest textile mill in Africa. Buhari is challenging Nigerians to introspect and unleash their creative geniuses. Unfortunately, politics is providing a distracting counter-intuition to these breath-taking developments. Where will Nigeria be in 10 years if we continue (or forced to continue) to look inwards? Imagine what will happen if we continue to produce a large chunk of what we eat, wear, drink,. Imagine when Aba, Sokoto, Nnewi, Kano, Ondo, Osun, Benue and Nasarawa turn natural endowments into skills; imagine when our universities and polytechnics wake up. Imagine when our industries and blue-chip companies begin to produce. Only a bold step like Buhari’s CHANGE will give form to these imaginations. If you did not understand Buhari’s change, it is not Buhari’s fault. Regretting voting Buhari says so much about your character. Asking “Is this the change we voted for” is the clearest indication that you must never be taken seriously again. You are a plastic supporter, but having read what I have written here, I suppose your mind has been bought back to life for us to continue the project of CHANGE we started in 2015 by pushing Buhari to continue again in 2019.